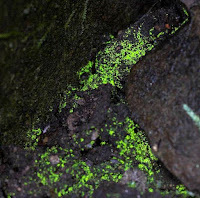 The Fern and Mossery: Is Moss Magic? Oh the attraction of simple moss. A vibrant green patch, a soft carpet on the forest floor or alongside a creek. Many terrarium builders seek moss for their projects as its diminutive scale suits terrarium life quite well. But the world's fascination with moss runs much deeper than just crafting. Moss has associations with magic, with fairies gardens, with damp and shady glens. Botanist Robin Wall Kimmerer explores the abstract side of moss in her book Gathering Moss: A Natural and Cultural History of Mosses. Her affection for common moss is apparent, but her scientific knowledge of bryology allows her to share stories of some of the world's most spectacular and unusual moss. Kimmerer describes Schistostega pennata, known as Goblins’ Gold, a unique moss that subsists in a rare habitat where the undersides of rocks along a lake receive reflected light. "The shimmering presence of Schistostega is created entirely by the weft of nearly invisible threads crisscrossing the surface of the moist soil. It glows in the dark, or rather it glitters in the half light of places which scarcely feel the sun.... Rain on the outside, fire on the inside. I feel a kinship with this being whose cold light is so different from my own. It asks very little from the world and yet glitters in response." Read more about this singular book at Brain Pickings. I'm glad I'm not the only one with a possible unhealthy appreciation of mosses! There's something about they way they glow in the light just after a rainfall, it's a kind of green you don't see many other places. Love it! It is a great green. Thanks for sharing! That's so exciting; thank you for sharing!